Hello, and welcome to my first (of hopefully many) Monthly Roundup! These features will be published at the end of each (you guessed it!) month and are intended really as just a recap of the goings-on in the world of cricket over the past few weeks – there’s a lot happening and it’s easy to miss things at the time. I’ll tend to focus on international cricket played between the full member nations of the ICC, not because I don’t find other cricket interesting – nothing could be further from the truth – but because there’s a lot of cricket happening out there: there’s no way I can keep up with it all, however much I’d like to. Associate and domestic cricket will definitely get a look in if something remarkable happens, though. Generally, these pieces will comprise brief summaries of matches that have been played over the last month with my opinions and some interesting and noteworthy stats thrown in. I won’t cover things in any great depth, but I’ll include links to relevant scorecards and match reports so that you can get all the details if you want to. After an unexpected win against Pakistan in the UAE and victory over Sri Lanka in the first half of their home summer, the Black Caps continued their impressive test form as they claimed a 2-0 series win over Bangladesh. Whilst admittedly hampered by the unavailability of Shakib Al Hasan, the tourists never really seemed in the running, with each loss being an innings defeat. The only real bright spot for Bangladesh was the performance of Tamim Iqbal, who was their only batsman to score runs when each match was still an open contest, though Mahmudullah and Soumya Sarkar each reaching their highest test scores provided a degree of consolation. There were rather more positives for the New Zealand team to take from the series, with a double century apiece for Kane Williamson and Ross Taylor (the former coming as part of their highest ever innings total in this format), a maiden test ton for Jeet Raval and continuations to the recent excellent form of Tom Latham and Henry Nicholls. Trent Boult and Neil Wagner both returned excellent bowling figures (the latter especially), although after enjoying considerable success recently, Tim Southee was expensive and, on the whole, not particularly threatening. Test cricket’s two newest test nations travelled to Dehradun, India, for a cross-format tour which saw Afghanistan experience considerable success, including a record breaking T20 performance, culminating in their maiden victory in the test arena. They were the more impressive team across each of the formats (perhaps not surprisingly, given the location and conditions on offer during the tour) and will rightly take much pride from their performances. It was not all bad news for Ireland though, as they did manage a consolation win the the ODI series and although they initially seemed headed for a humiliating defeat in the test match, they ultimately put in a creditable performance. With both sides scheduled to play more test cricket over the coming months and years, the tour will have provided an invaluable experience. Having initially continued their recent horror run in One Day Internationals by going 2-0 down in their five-match series against India, a series of impressive performances saw Australia bounce back emphatically to win the series 3-2. They seem to be peaking just in time for the upcoming World Cup, with Pat Cummins continuing his rapid improvement in the format and their stalwarts, fringe players and new faces alike all having put forward a case to be in the starting XI come the end of May. India, for their part, have a few concerns. Their batting has recently seemed overly reliant on Virat Kohli, with their key top order batsmen Rohit Sharma and Shikhar Dhawan having been below their best and their middle order unable to consistently impress. Crucially, MS Dhoni still seems a shadow of his former self when the situation calls for rapid scoring, but when Rishabh Pant replaced him part way through the series, the drop in quality behind the stumps was stark – a conundrum with not much time left to solve. Their bowling too seems to have lost some of it’s guile as Australia, not a team reputed for excellence in subcontinental conditions, ultimately seemed to have their measure. Having completed their remarkable and unexpected win over India, Australia’s travelled to Dubai to face Pakistan in their final ODI series before the World Cup. The five matches saw both sides, not always by choice, give some of their fringe players a chance to prove themselves, to varying levels of success. Individual performances aside, Australia were consistently the better of the two sides and deservedly recorded a 5-0 whitewash, meaning their current winning streak is an impressive 8 games and their biggest problem is who to leave out from their starting XI at the World Cup. After the result of the South Africa – Sri Lanka test series (a 2-0 victory for Sri Lanka) shocked the world, the limited overs matches the followed went rather more along with expectations, with South Africa winning all five ODIs and all three T20s. However, whilst they will have enjoyed this small measure of revenge, they should be aware that it perhaps does not represent ideal preparation in advance of the World Cup insofar as the series served only to reaffirm what they already knew – that their top order is very capable. Their questions revolve around their middle order and bowing attack: the former was not given the chance to answer either way and whilst their bowlers did, on the whole, very well, with all due respect to Sri Lanka, they could have had tougher opponents against which to identify areas for improvement. Unfortunately for South Africa, they have no further matches left in which to try to find answers before the World Cup begins. Sri Lanka’s trophy hopes will have been slim to begin with, so this crushing defeat in the lead up to the tournament won’t really change much for them. Unfortunately, this is probably the only (slightly) positive thing that can be said for the team, who never really came close to winning any of the games. I would like to give a special mention, however, to Isuru Udana, whose several exciting cameos (plus a couple of larger scores) meant that the matches remained enjoyable even once the result had become a foregone conclusion. After a couple of high-scoring thrillers earlier on, the final match of the England vs West Indies ODI series proved a chance for England to showcase another of their trademark dismal batting collapses as they meekly surrendered before the lunch break to finish the series 2-2, their misery compounded as the West Indies raced to victory on the back of another fireworks display by the resurgent Chris Gayle. A three-match T20 series followed and, after a fairly unremarkable opener, more shambolic batting was soon on display. In the second match, with a barnstorming performance from Sam Billings having rescued England from another poor start, it was the West Indies’ turn to collapse ingominiously as they were bowled out for just 45 – their lowest ever score in the format and the second-lowest by any team. The next match was marginally less dismal for them as, batting first this time, they made it all the way to 71 all out. 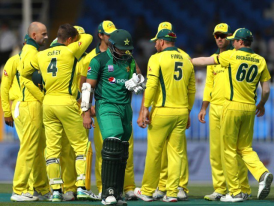 Perhaps the teams were feeling fatigued and uninterested towards the end of the tour, but whatever the reason, both have had their batting frailties exposed with uncomfortably sharp focus as the World Cup looms closer. Well, my earlier proclamation that “I’ll tend to focus on international cricket played between the full member nations of the ICC” is now looking a little bit foolish as Cricinfo’s calendar tells me that there is almost none happening in April! The lull before the storm, perhaps, with the World Cup and the Ashes on the way in the months aftewards. Anyway, the IPL will be in full flow over the next few weeks and the County Championship will be starting too, so I’m sure I’ll find something to write about. Until next time!